I wait for a break as week 3 of being housebound fast approaches. I wait for a break today when a fellow mother selflessly drives up all the way from Waterford to me here in north Kildare to give me that 3 hours of respite I desperately need. I wait to hear why I haven’t had HSE provided in-home respite for months now, only to find out the nurse and home aid who previously provide this service are no longer with that company and now there is no one available to help me. I wait for a break for my son, Brendan Bjorn, who has laid trapped in his bed for over a month now with a pressure sore that has only worsened, not become any better. I wait to hear from the county’s Tissue Viability Nurse so we can set an appointment for her to (hopefully) call out to the house and examine Brendan Bjorn’s painful pressure sore. I wait…I think somewhat pointlessly…wondering why the powers at be have left us out here in the middle of nowhere with little to no urgent intervention and assistance. I wait for a break in housing, dreaming one day that – please God, before it is too late – I will receive the news there is a suitable, safe, bungalow ready for us to move into and call our forever home. I wait for nearly anyone to ring me with offers of help, alas, I wait mostly in vain. I wait for arms to someday hold me so I can cry uncontrollably, finally releasing even a portion of the pain buried so deep within. I wait for so many things to improve because without hope I will be lost. And I wait to see how much longer I can go without breaking. Today marks 15 days since I’ve been able to leave my house. Brendan Bjorn has been bedridden with a pressure sore, so unable to get into his wheelchair, for over a month. This is the second time this year I’ve been in this situation. Unable to even go into the village to get cash to pay for firewood (thankfully I’m able to run a tab) or get the indulgent chipper delivery on occasion. Unable to get groceries and needed household items (thankfully Tesco delivers for a fee). Unable to even go for a walk and clear my head. This is it. 15 days and counting. Here in Ireland in the past 24 hours, 2 people who had been missing for weeks – totally unrelated cases – have notified their family that each of them are thankfully ok. I’ve followed both stories, retweeting calls for help by brothers, sisters, Gardai, etc, in locating these much loved missing family members. One of those missing was is a Psychiatrist. Maybe it’s because I too am a mental health professional (note: in the days before having to become a full time, unpaid carer) that I find this particularly striking. I don’t know this clearly much loved lady, but my heart aches for whatever it is she is going through which led her to hide herself away from her family without any word of assurance that she was alright. If I went missing for 15 days, barring of course the fact that Declan’s school would wonder where he was, would there be the social media and Gardai campaigns asking for help locating me? The answer, quite simply and frankly, is no. Sure, I have no doubt my many kind friends on social media would wonder why I was so uncharacteristically silent, and maybe even wonder if they had annoyed me somehow and that’s why I wasn’t replying to their private messages. But on the whole, the answer is that no one actually sees me in person to know I would be missing. That hits hard. And it should hit ALL OF US hard. I say it should, not solely because of me or my situation, but for the hundreds, if not thousands, of people across our lovely island who also have no one calling in on them; who go days or even weeks without seeing another human being. Please, let that sink in…people who go days or even weeks without seeing another human being. I find that extremely disconcerting and terribly heartbreaking. Humanity is missing in situations such as this, and despite us being overly connected in this electronic world of ours, we are void of true connection far too often. I want us all to think about who is in our own local community that needs personal connection. Who is alone? Who needs help? Who says everything is grand yet your gut tells you no it is not? Let’s not lose our sense of looking out for others in the spirit of true community. A few days ago, the boys and I had a lovely RTE producer into our house to film a segment on an upcoming Christmas special (It will air December 10th). Even though we delayed the filming by a week, it didn’t change the purpose of the delay: Brendan Bjorn was…and is…still bedridden with a pressure sore. This Christmas is the first time he has not been able to see the Christmas tree the day we put it up. And I wonder, how long will it be before he gets to come into the sitting room to enjoy it? Now, for those of you reading this that think it’s no big deal, let me tell you it is in fact a very big deal. Christmas trees are one of Brendan’s most favourite things in his limited world. He could, and does, stare for hours at the tree with all the bright lights and shining decorations, smiling and laughing at what I’ve always thought must be angels that only he can see. It is pure and absolute joy! But this year, he hasn’t yet seen the tree, and that hits deep into my heart. Why? Because I know that each Christmas may well be his last. I have been willing with all that I am for his pressure sore to heal. I have been guarding it, dressing it, cleaning it oh so gently, protecting it…but still it remains, now over a month. I’ve even cancelled 2 days of overnight respite because it would mean him having to sit in his wheelchair for over an hour to the respite house just to get there. I cannot, I will not, risk it doing more harm, no matter how desperately I need a break…and I need a break! And with this, part of our usual Christmas magic has ended. This morning, another part of Christmas ended, and it found me sobbing as the passing of years has again stolen something precious to me. Declan, my clever, loving, precocious 9 year old son, now knows that Santa doesn’t exist. I knew this day was coming, but I had held out hope that we would make it through this Christmas still holding onto that magical belief. But, it wasn’t meant to be. “So, you’ve been Santa all these years…I knew it!” he said. We talked about the spirit of Christmas, the giving and loving and sharing that Santa is to represent, and that we should continue to carry in our hearts. “We will, Ma, we will.” he said to me with that gentle smile on his face, and he hugged me tight. My baby, my only child with whom I got to share the magic that is Santa, no longer believes in Santa. It is hitting me harder than I expected it would. 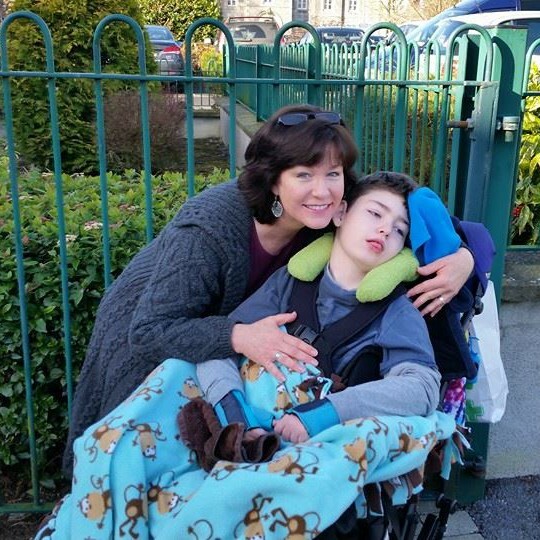 One aspect of this journey with a child who has a life-limiting condition is that it can often put reins on the parent from looking too far ahead. Christmas. We have this Christmas with Brendan Bjorn and that is all we can be assured of, so we make it the best, brightest, cheeriest one possible, just as we do every Christmas so far. And even though some of the magic has ended, I won’t let it steal the time I have with either of my boys – which is right now. If I have to drag that Christmas tree into Brendan Bjorn’s bedroom, so be it. Christmas in his bedroom? Why not?! It’s the least I can do for my child who can do so little. It’s what Christmas magic is all about: the sharing of love. Every once in awhile on this journey with a child who has a life-limiting condition, something happens to trigger a flood of emotion. It usually comes like an unexpected deluge from the sky – except this sudden wave of emotion comes from deep within the intentionally well-hidden centre of our being. You see, dear reader, parents like me keep great amounts of pain tucked away where no one can see it…and, as a matter of self-preservation, where we ourselves often can’t readily find it either. But every once in awhile, something happens. This morning I awoke to find it had rained hard overnight. Very hard. The front drive was flooded. Had Brendan Bjorn not still been on what is now approaching a month of being bedridden due to the pressure sore once again opening up, I would not have been able to get him out of this sorry excuse for a home. Only a few minutes later, I looked out the back window and discovered that the septic tank had been flooded out with all the rain, so the sewage (I’m being polite here) was literally streaming across the tarmac in the back garden. The smell wafting through the house – even as I type this, as the issue isn’t yet resolved – is nauseating. But this actually isn’t what triggered the flood of emotion. It was something a friend on Twitter wrote under my posted photos of the scene. Yes, yes I am, I thought to myself. And with that, the flood of emotion came rushing at me. I am a prisoner here in many ways – as is Brendan Bjorn and as is Declan. We are stuck in an unfit, unsafe house with nowhere else to go AND I AM FURIOUS about that fact! Having tried unsuccessfully for a year to find a suitable, disability friendly home to rent with HAP, I’ve given up any hope of renting. I found myself standing in the doorway of Brendan Bjorn’s room this morning, crying. I looked over at my beautiful, precious angel and cried. Simply put, I hurt. And I hurt for so many reasons: the feeling of being a prisoner with no other housing option; the feeling of being trapped inside a house while my son is bedridden, leaving me once again housebound, caring for him 24/7; the feeling of being alone…no, scratch that – it’s feeling lonely…as I try to do everything on my own to keep a household functioning all while trying to keep one son alive and out of pain and the other son happy and able to reach his full potential without suffering the side-effects of our often challenging journey; the feeling of being overwhelmed as I look at the 6 foot high shelf full of Brendan’s daily medications and supplies which I go to countless times a day in my caring of his fragile self. I know that tomorrow is a new day, and with it, there may be great joys, good news, and new reasons to smile. But for now, for this moment, parents like me can’t go against that tidal wave of emotion once it has found its way to the surface. All we can do…all I can do…is ride that wave until the water calms. The time to refocus. The time for change. Last weekend I had an exceptionally rare two days of respite where I was without either of my sons. I drove up to Carlingford, checked into a lovely little airbnb cottage, and took the opportunity to contemplate life. As a result of a few hard come by realisations – or maybe they were actually well timed reminders? – I came away having made some important decisions. One of the most pivotal realisations was, of course, about my precious Brendan Bjorn. He is now over 3 weeks bedridden, again, due to a pressure sore re-opening. He has been in school ONE day since this school year started. Last month, he had a frightening episode of unconsciousness for the first time in his 13 years, which the best educated guess from the neurology team is that he was in nonconvulsive status epilepticus. To say it is a worrisome development is an understatement. He has yet another urinary tract infection. And, he will be undergoing a spinal fusion in the hopefully near future, which for him will require many weeks of recovery time. So as I sat in this homely cottage listening to the soothing sounds of the rain falling on the rooftop, I realised…and even more painful, I accepted…that school is no longer a priority for him. It probably never will be again. Yes, he will be enrolled in school, and if he is well enough to attend even 3 partial days per week, I will find that a tremendous achievement. What matters most now is his health, his comfort, his safety and his happiness in having the best quality of life possible. Declan, my little boy who is growing up far too fast with life’s numerous challenges, needs a forever home, a place to call his hometown, and with that, the security which will see him grow into a confident, stable young man. He needs the opportunity to thrive, and he deserves nothing less. Then there is me. As I did during the few days when I went on my own to Norway in 2015, this past weekend away I remembered Tracy – the creative, active, outdoor-loving and spiritually centred woman who is more than solely a mother and a full time carer to her severely disabled son. I was reminded of what I need in order to be at my best, and being at my best is vital if I am to provide everything that my two beautiful boys deserve and require for their individual life paths. I have decided the boys and I will not be returning to Kilkenny. We will return to County Louth, where I first lived when I moved to Ireland more than two decades ago. My dearest friends, including Declan’s Godmother, are there. We will be closer to Dublin for all of Brendan’s medical services. Declan will be closer to those he considers family. There are many reasons for this decision, a number of which are too esoteric to explain. As I walked along the 8km greenway between Carlingford and Omeath, the water to one side and the mountains to the other, I felt that holistic sense of peace that comes when I am in such an environment. Simply put, it’s where I need to again return, but this time, it will be for good. I had the time to refocus. Now it is the time for change. Some say “Hope for the best, but prepare for the worst.” I’ve never been fond of that phrase, although I am guilty of having repeated it on more than one occasion. We all know, somewhere in the recesses of our mind, that the worst can, and sometimes does, happen. But should we actively prepare for it to happen? I don’t think so because if we do that, it will taint the hope, restraining hope’s ability to lift our spirit. So, to live in hope. Today I hope that by the end of this week, when Brendan Bjorn goes for a couple of nights respite, his pressure sore will once again be healed and he can get out of his bed to enjoy the world around him. He has, once again, been bedridden since 26 October, except for necessary trips to the doctor. I live in hope it heals well and heals quickly. While Brendan is in respite, I am going to take a break. It will be much needed time to relax and hopefully clear my mind of those worries that come with “preparing for the worst.” Declan will be staying with friends, so it will just be me on my own. Maybe while I am out there walking the greenway along the shoreline or on a mountain trail, I will find even more hope to hold on to. Sunday will find me and Brendan overnight in hospital as he undergoes a sleep study and assessment for his upcoming spinal fusion. While I live in hope this operation will bring to him relief and improved overall health, that hope is indeed laced with fear – maybe even terror – in the knowledge that his fragile body will be facing its toughest challenge to date. I live in hope, despite that knowledge, because I must. Hope that the new wheelchair accessible van being delivered this very afternoon will take us safely on many happy family outings, creating lifelong memories the entire way. Hope that we will soon find a house to call our own home; one where we will be warm and safe and contently filling it with love. Hope in a long-awaited meeting in the coming weeks when the person with that voice on the other end of the phone – the voice who makes these previously sleeping butterflies inside of me fly with reckless abandon – will instead actually be sitting right beside me. Hope that laughter flourishes, fears subside, and all that can be beautiful in life is allowed to blossom. Hope that I can forget all about preparing for the worst, at least for awhile…at least long enough to taste the sweetness that is genuinely living in hope.